Tinkergarten® announces its rapid national expansion, empowering new leaders to bring its unique, all-outdoor, early childhood learning program to families in the San Francisco Bay Area. Tinkergarten®, the leading provider of local outdoor early childhood education, has announced the launch of new leaders and new classes in the San Francisco Bay Area this fall. Twelve initial leaders have been selected to offer classes for families in city locations such as San Francisco’s Golden Gate Park, Noe Valley and Glen Park, Peninsula towns such as Mountain View and Los Altos, beach communities of Pacifica and Santa Cruz, and East Bay locations such as Oakland and Berkeley. “Kids are growing up with easy access to technology, and the Bay Area parents who are leading the Tinkergarten movement share our desire to provide balance in their children’s lives, bringing back free time to gather together, play, and tinker outdoors,” said Meghan Fitzgerald, co-founder and Chief Learning Officer. 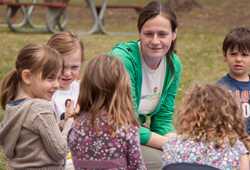 Tinkergarten has been gradually rolling out its program to a number of markets in the U.S., including the greater New York Metro Area, San Francisco Bay Area, New England, New Jersey, and Oregon. As new leaders are selected through the application process (https://tinkergarten.com/leader), additional classes will be added throughout the Bay Area this fall, and more regions will be activated nationally. Tinkergarten provides the best early childhood learning in the healthiest classroom of all—the outdoors. A technology platform vets, trains and mobilizes a distributed workforce of passionate, local leaders to run their own local classes designed to help kids become well-balanced people who can problem-solve, lead, and create. Classes take place in local green spaces where leaders, parents, and kids meet up to spend time each week doing hands-on activities that are engaging, educational, and fun for everyone. Leaders, often parents themselves, use Tinkergarten technology to deliver an innovative, skill-based curriculum and experience that is all outdoors, fun and engaging for kids. Tinkergarten also gives parents a rich photo history of their child’s experiences, and provides a unique window into their learning. Tinkergarten is rapidly expanding nationally—classes are offered in select communities throughout the New York/Tri state area, New England, Oregon, and Northern California.